He is an outlaw opportunist. He is an ineffective, absent leader. He is a money-grubbing menace who has put his personal ambition over public safety. Moose, who was ubiquitous during last fall's Beltway sniper investigation, is nowhere to be seen in our neighborhoods these days. He has supposedly been on active duty for the Air National Guard, "helping his air guard unit develop an anti-terrorism force protection plan," according to the Washington Post. When he's not avoiding phone calls about whether he ever plans to return to his old job, he's traveling across the country giving supposedly expert speeches about leadership and crisis management. Meanwhile, morale among his rank-and-file officers has plunged. One veteran Montgomery County cop told me this week: "The chief is snubbing his nose at us. All he cares about is money. What kind of leader is that?" A quick visit to Amazon.com reveals what Moose has really been up to while out of the office. Instead of fighting crime and protecting his local community, as his $160,000 government salary requires him to do, Moose has been readying the fall launch of a book capitalizing on his fame. 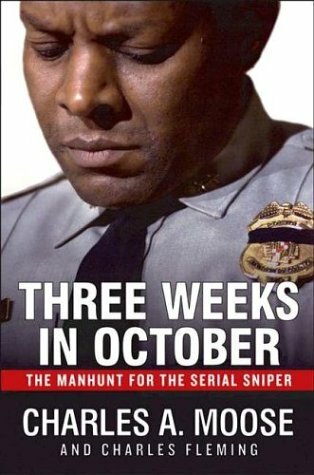 "Three Weeks in October: The Manhunt for the Serial Sniper," published by New York-based Dutton, features a huge cover photo of Moose wearing his prominently-placed, shiny police badge. Moose and his publisher have put the book up for pre-order sales in defiance of a local county ethics commission ruling earlier this spring that barred him from writing the book. The panel concluded that longstanding ethics regulations—regulations he agreed to abide by when he was hired—prevented him from profiting from his job as police chief. The ethics watchdogs also suggested he would reveal confidential information to titillate readers. The commission's concerns about Moose's upcoming book publicity circus—which will coincide with sniper suspect John Muhammad's trial—were shared by several top local law enforcement officials who worked on the sniper task force. Henrico County Police Chief Henry W. Stanley told the Washington Post after a sniper task force meeting in February: "With all that's happened, we certainly don't want anything to jeopardize the trial. I felt, and I think the group felt, that we needed no more publicity that could add to the trial issues." The task force expressed unanimous disapproval of Moose's book publishing plans. But he treated his fellow police chiefs the same way he treated the county ethics panel: he ignored them completely. Instead of following the law, he and his big-mouthed wife, an image consultant and CEO of Chief Moose Inc., have hurled reckless charges of racism at county employees. Mrs. Moose whined to the panel that the couple resented having to answer to "a fully white group to give him permission to make some money." She likened her spouse to Martin Luther King and Nelson Mandela as a civil-rights trailblazer who "stood for principle." The Mooses have sued Montgomery County over the ethics ruling, citing their First Amendment rights. But their true motives are far less noble. In closed hearings, as first reported by Worldnetdaily.com investigative journalist Paul Sperry, Chief Moose grumbled that he made less than other police chiefs around the country and mentioned the need to pay off his wife's law school bills. Mrs. Moose pointed out that their house lacked antiques because of all the humanitarian sacrifices Moose has made on behalf of public safety. Moose, already the highest paid Montgomery County official, stands to earn a book advance worth a reported $160,000—and much more if the planned TV movie gets off the ground. This tacky pair should spare us their self-pity. As many local cops have argued, Moose's ambition, incompetence, and racial blinders may have cost some of the sniper victims' lives. Now, that greed threatens to jeopardize the integrity of the sniper trials. "My commitment is to the county and to be a good police chief," Moose insists. Hard to take seriously from a man who treats his badge as no more than a handy book-cover prop.